Is it just me, or is there a rising tide of reports about Amish-related mayhem? According to the report, deputies were "responding to reports that people were drinking in several Amish buggies on a country road" when the collision occurred. (It is tempting to speculate that there was some drunken Amish drag racing going on, but I've exaggerated enough already.) After the crash, the report states, "several other buggies fled the scene." I assume that means police stopped to help the victim, because it'd be pretty embarrassing to have to report that a bunch of Amish eluded you after a low-speed buggy chase. The other and far more dramatic Amish story is the one about the splinter group in eastern Ohio that has terrorized its local community with a series of beard-slashings. In November, for example, the Columbus Dispatch reported that a young Amish man had cut off his own father's beard after an argument. This was only the latest in a series of incidents for which prosecutors blame Sam Mullet (right), leader of a "breakaway Amish group" near Bergholz, Ohio. Mullet does not see eye-to-eye with church leaders in the area, and told the AP that the slashings were a response to criticism of his leadership. 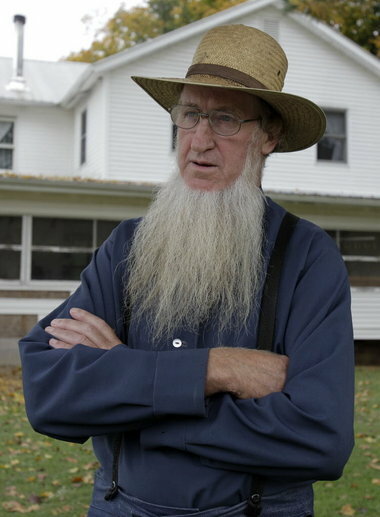 (The Amish believe that the Bible requires men to stop shaving after marriage — hence the beards — and so beard-cutting is considered especially insulting and traumatic.) 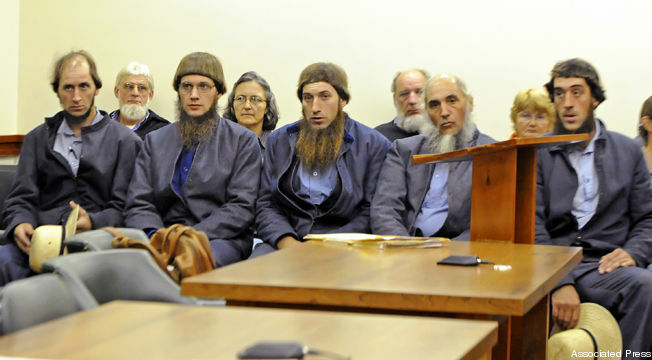 Eventually, Mullet and 11 other members of his group (described here as "an accused Amish beard-cutting mob") were arrested, and are being prosecuted under the federal Hate Crimes Protection Act. This was back in the news last week, when the mob's lawyers argued that the prosecution was unconstitutional because the law (which among other things prohibits causing injury "because of the actual or perceived … religion" of the victim) was overbroad. "The actions are not alleged to have been taken out of prejudice or hatred against the Amish religion," the motion reportedly argued. "Rather, the alleged acts are doctrine-based Old Order Amish beliefs" and "not alleged to be the result of anti-Amish bias." So if I understand correctly, they are claiming Amish-on-Amish violence simply cannot be a hate crime. I don't know about that one. If the "doctrine" involved was sufficiently different to lead to the attacks, which is what allegedly happened and something that the motion appears to concede, then it seems fair to say religion motivated them. The motion also raises a federalism challenge, arguing that even if the conduct is covered there is no real link to interstate commerce so the case doesn't belong in federal court. That seems like a much better argument, especially because one of the arguments prosecutors reportedly made was that the attacks involved interstate commerce because the scissors they used were made in New York. I realize the Commerce Clause is broad, but please. Prosecutors have until April 16 to respond. Apparently there are plenty of other allegations against Mullet in addition to the ones about running a beard-slashing gang, so it would seem that he is headed for trial no matter how this one turns out.